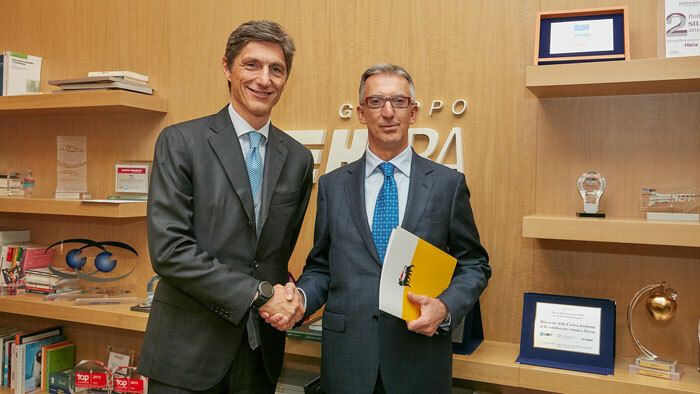 Italy’s oil and gas company Eni and the Italian multi-utility company Hera Group have signed a partnership agreement with the aim of converting used vegetable oil into biofuel for Hera’s waste collection vehicles. The agreement revolves around household waste vegetable oil, such as that used for frying, collected by Hera in around 400 roadside containers and about 120 collection centres. It will be sent to the Eni bio-refinery in Porto Marghera, Venice, Italy. This is the first oil refinery in the world to be converted into a bio-refinery for the production of green diesel, a completely renewable product that accounts for 15% of Enidiesel+. This biofuel will power Hera’s urban waste collection vehicles. During an initial phase, Enidiesel+ will be used by around 30 large vehicles in the Modena area to test and optimise the fuel’s environmental benefits. The deal signed on 23 November extends the already thriving circular economy that Eni has established with multi-utility companies in Turin, Venice and Rome. Results from tests have shown major benefits in terms of air quality, the economy and industry. Compared to conventional diesel, Enidiesel+ features a renewable component that reduces polluting emissions by up to 40%, consumption by about 4% and engine maintenance costs. To further support of the initiative, Hera has decided to boost the roadside collection of vegetable oil by introducing 300 new, dedicated containers in the areas in which it operates. In 2017 alone, 800 tons of waste vegetable oil was collected, recovered and processed for use either as lubricants or fuel. This service is increasingly comprehensive. It also provides an incentive to properly recycle waste oil and also works to prevent behaviour such as pouring oil down the sink, which damages household plumbing and water treatment plants. “An economic model is truly circular if it addresses the entire lifecycle of resources, with genuine partnerships among the businesses involved and residents. It would go beyond merely managing the final stage of collecting waste that perhaps has been delivered to third parties,” said Stefano Venier, the chief executive officer of the Hera Group.